The main decision-making body of the World Medical Association (WMA) is the General Assembly, which meets annually. The Assembly comprises delegations from the National Member Associations, the officers and members of the Council of the WMA, and representatives of the Associate Members (Associate Members are individual physicians who wish to join the WMA). The Constituent Members of the WMA (National Medical Associations) elect the WMA Council every two years with representatives drawn from each of the six WMA regions, namely Africa, Asia, Europe, Latin America, North America and the Pacific. 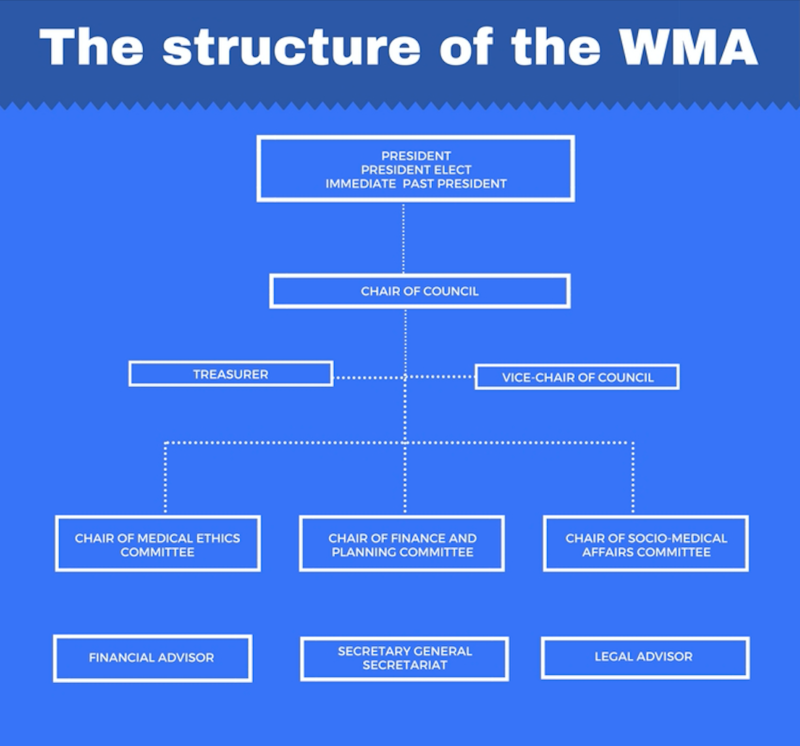 The Chairperson of the Council, elected by the WMA Council every two years, is the political head of the organisation. The Ceremonial Head of the WMA is the President, elected annually by the General Assembly. As Chief Executive of the operational units of the WMA, the Secretary-General is in full-time employment at the Secretariat, appointed by the WMA Council. The WMA Secretariat is situated in Ferney-Voltaire, France, adjacent to the City of Geneva. Who can be a WMA member?